Pita bread is known as Arabic bread or Lebanese bread.It is very soft, slightly flatbread baked from wheat flour.Some people use all purpose flour or maida but whole wheat flour pita bread is very healthy.Pita bread is served with just about every meal in the middle east. It can be used in making all type sandwiches in the pocket and wraps also. Dissolve yeast in half cup of warm water, add sugar, olive oil and stir until dissolved put aside for 15 minutes until water is frothy. Take a big bowl add flour, salt mix it well, make a small place in the middle of the flour and pour yeast water we make it.Make it soft dough with warm water, knead 5-10 minutes. Coat a large bowl with olive oil and place dough into the bowl. Turn up and down so all of the dough is coated.Allow raise in a warm place for3-4hours or until it doubles in size, knead the dough again. Divide dough into a medium-small portion of dough makes it flat round with the help of board and roller pin. Put a tawa on medium heat flame when tawa is heated gentle lift pita, place pita over it when the bubbles appear on top flip it. It will puff up within 2-3 minutes. 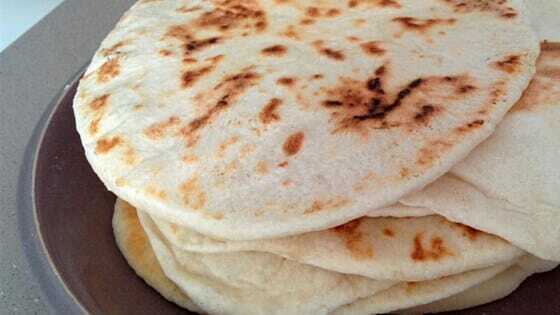 Flip it again and cook 1-2 minutes another side.Soft and tasty chewy pita bread is ready. Serve it hot with hummus, falafel, make pocket sandwiches etc.